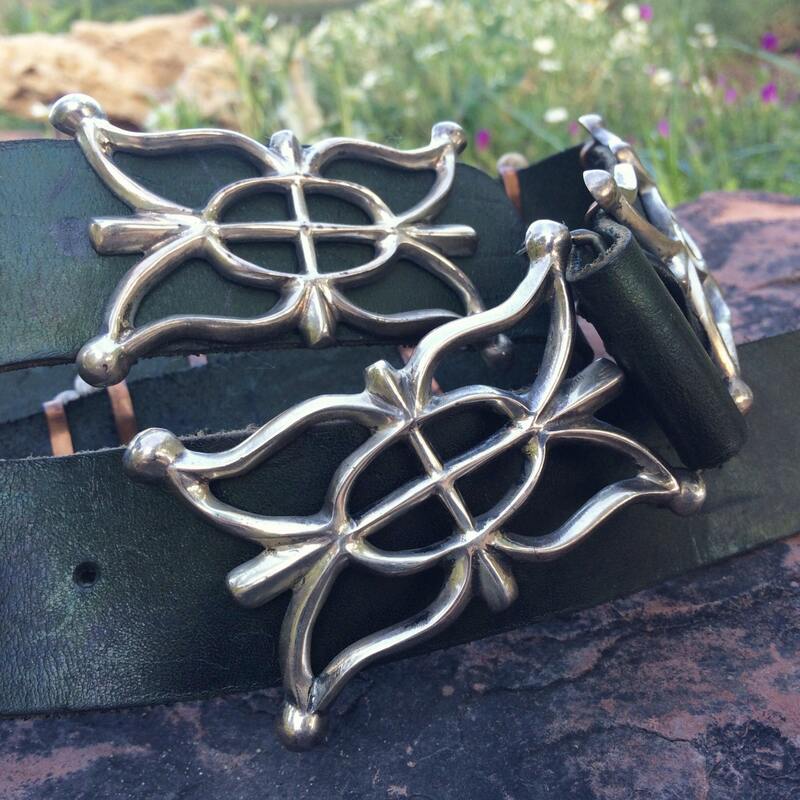 This traditional sandcast sterling silver concho belt came from the estate of a New Mexico family. 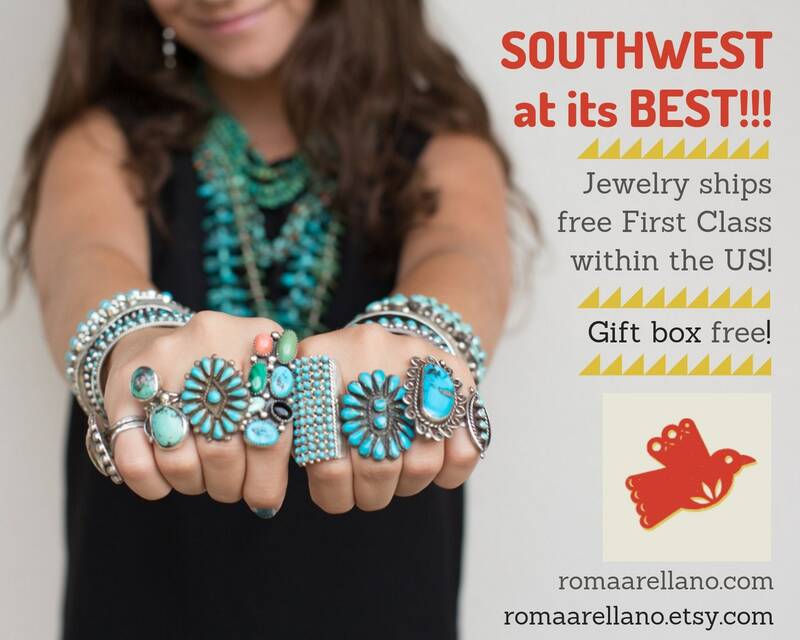 The father had a Native American Indian shop and traveled all around New Mexico in the 1950s until his death in the early 1980s, buying directly from Native Americans both for his shop and to sell to other shops in Albuquerque's Old Town. 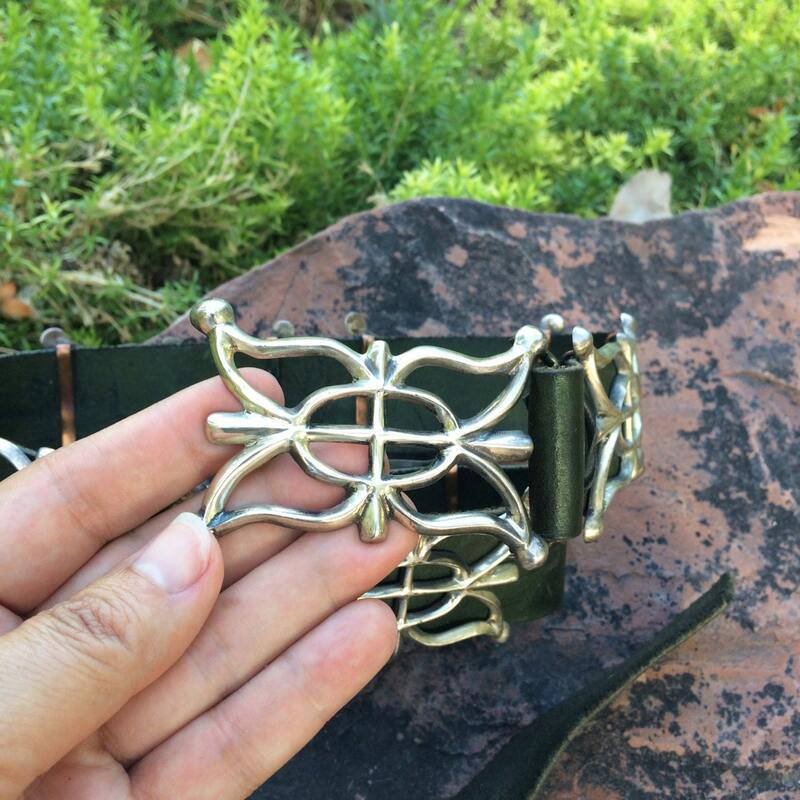 His wife held on to a few pieces until her death in the 2015 timeframe, and their daughter sold me a few pieces that were left, the belt being one. 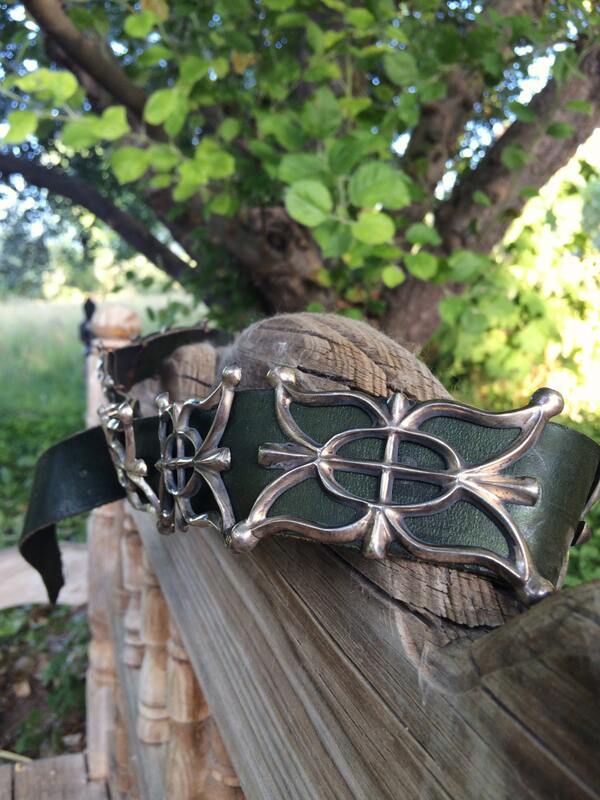 It features nine sandcast sterling silver conchos, including the buckle, on a wide, supple leather strap. 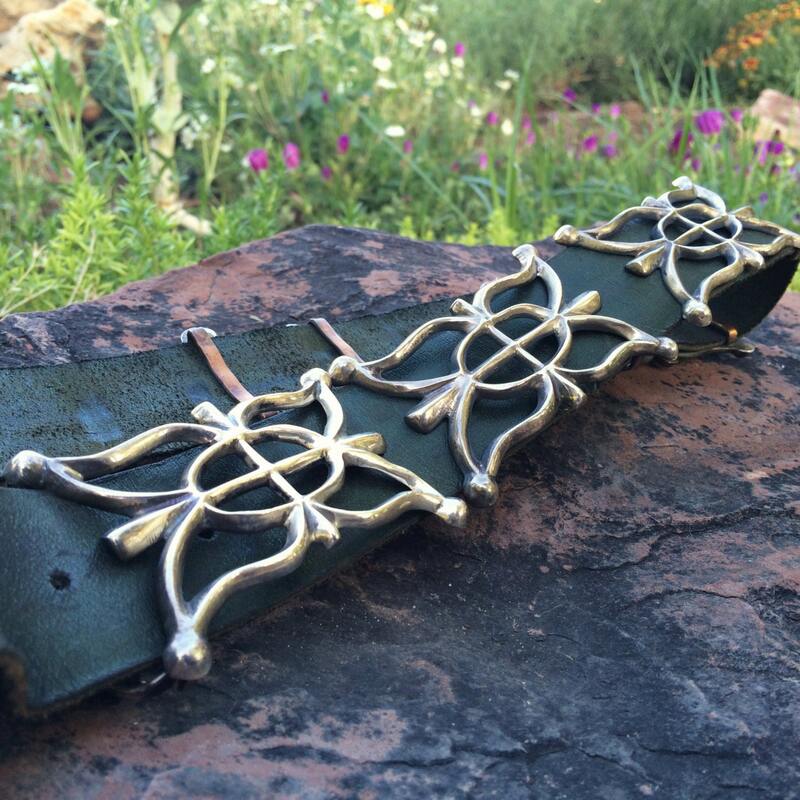 Belts like these were traditionally worn by both men and women, and this one has enough length in the belt to make it a unisex piece. If you consider that one sandcast buckle or even bracelet is generally about $200, then to have nine at this price is quite a good value. 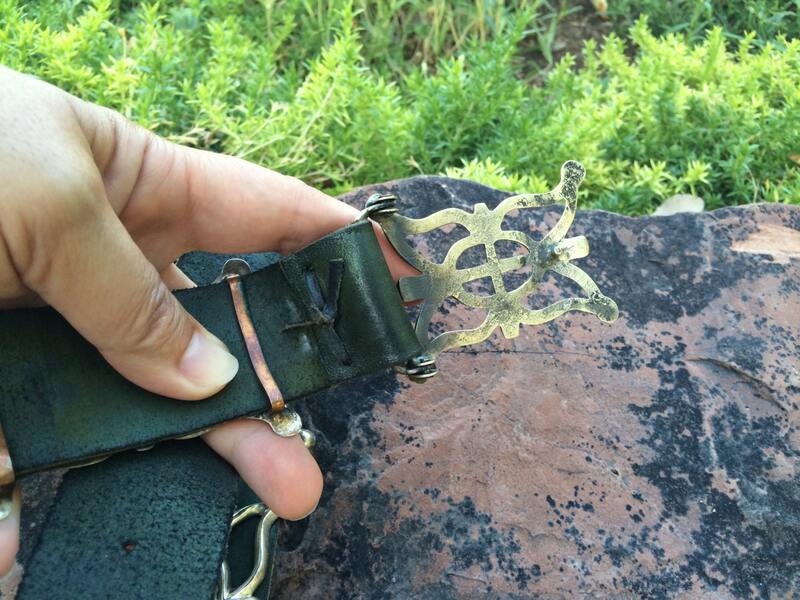 The leather belt measures just under 44" long from the tip of the buckle to the tip of the leather strap--and the strap extends almost a foot beyond the place where the last concho would sit. The strap is about 1-1/2" in width. Size from first (closest) hole in the leather strap to the hook: 32". Size from last hole (farthest) to hook: about 37", but keep in mind that you can make another hole or two beyond the last belt in those five inches left over. Belt Sizing rule of thumb: Since conchos are generally worn low on the hips versus at the waist, take your hip size and add 4” to it. For example: 32 hips = 36" belt size. Do keep in mind that while conchos can be spaced out, the belt is most ideal for about 37-38" waist due to the number of conchos. Each of the nine conchos measures about 3" wide by just under 2" tall. A classic piece--to last a lifetime.